All transactions are safe and secure with a reliable history in online purchasing behind each of our associates. Buy the Star Trek The Next Generation t-shirt to own Star Trek clothing and merchandise. Do you think Star Trek The Next Generation blew all the others out of space? You wouldn't be the only one. This 18 Emmy Award winning series has a loyal fan base that believes Captain Kirk has nothing on Captain Picard. 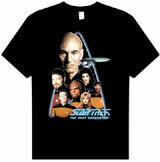 This t-shirt features Patrick Stewart, Jonathan Frakes, LeVar Burton and the rest of the award winning ensemble. It deserves a place in every Star Trek fan's clothing collection. In addition to the Star Trek The Next Generation tee above, browse the Star Trek Clothing Gallery for more apparel like men's and women's clothes, kids shirts or hoodies.